Due to the diverse and complex nature of chemical products, sieving and filtration systems play an important role in the production process to ensure the desired product specification can be met each time. 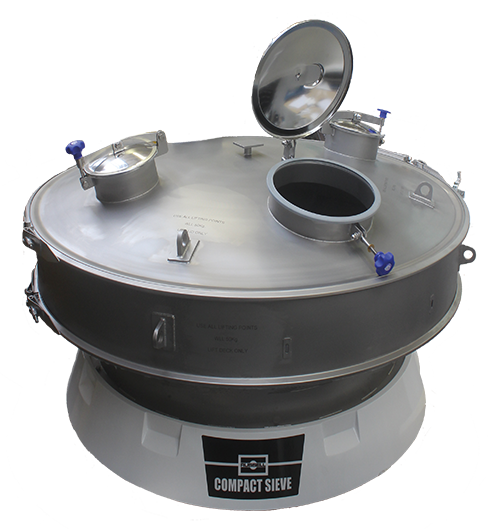 When approached by a chemical manufacturing company for a new separation solution, following an in-depth consultation, Russell Finex supplied the customer with a customized vibratory sieve, replacing two rotary sieves which were previously used. With this particular application in mind, several modifications were made to the 1500mm Russell Compact Sieve® supplied to ensure production efficiency and minimize downtime. As there were only small amounts of oversize contamination that needed to be removed the vibratory sieve was supplied without an oversize outlet, which also provided the added benefit of reducing the loss of good product. For the little amount of oversize that stayed on the mesh the customer manually cleaned the screen. To minimize the time of this cleaning process eight connection points were added to the lid and sieve deck. By using a winch, the lid and the sieve deck can easily be lifted either separately or together for vacuum cleaning, and to easily change the mesh screen. In addition, in order to allow easy access for the operator to check the amount of oversize on the mesh, a combination of a large inspection hole and three smaller inspection holes were added to the lid. Lastly, to improve ease of use and minimize downtime a quick release clamping system was installed on each lid of the inspection holes. With this customized chemical screener the customer was able to achieve their goal of an increased production rate through minimized downtime, ease of access and maintenance. Russell Finex acknowledge that no application is the same. By offering their in-depth knowledge and listening to customers, a customized solution can be provided for almost any application. Contact us for more information on how this vibratory screening machine can help you with your unique requirements.